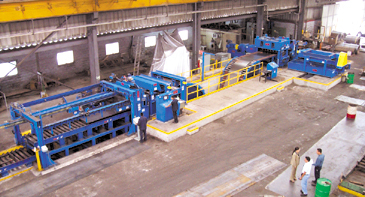 Monterrey, MX - Fortacero SA de CV, a large flat rolled steel distributor and coil processor has installed a Braner/Loopco Cassette Leveler Servo-Feed Cut-to-Length Line in its Monterrey Mexico flagship facility. The new CTL line is capable of processing 75" wide x 80,000 PSI yield strength hot rolled black & pickled and cold rolled carbon steel coil in gauges from .024" through 1/4". 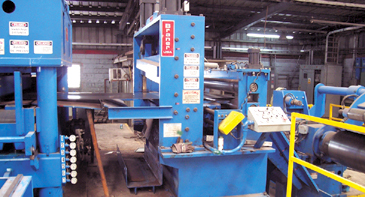 The line processes from 20" to 75" wide weighing up to 25-tons and produces panel flat sheets in lengths to 20'. The new Cassette Leveler CTL line is Fortacero's second Braner/Loopco CTL line, joining a 75" x .024" to 3/8" Cassette Leveler-Servo Feed line operating in Fortacero's Mexico City facility. 1/4" x 75" Hi-Strength Cassette Leveler / Servo Feed Line. Entry Station: A telescoping blade Peeler, hydraulic Pinch Rolls, and pushbutton positioned Side Guides thread the coil into the Entry Shear where the coil lead-end is cropped and squared-off. A Scrap cart collects the sheared head end scrap. A laser aids master coil positioning on the Uncoiler while a hydraulic servo non-contact Edge Control automatically maintains coil edge alignment while running. Entry Station aligns, threads and crops the lead end of the coil. Cassette Leveler: A massive 4-post "Cassette" type corrective Leveler equipped with two (2) interchangeable Cassettes delivers panel-flat sheets throughout the entire .024" - .250" gauge range. A 1.625" x 4-Hi Cassette processes gauges from .024" through .100". A 3.500" x 4-Hi Cassette is employed to process hi-strength gauges from .075" through .250". Cassettes are exchanged via pushbutton in about 2-minutes. Benefits of the Cassette Leveler include a wide gauge and product range, simplified work roll, back-up, and universal shaft maintenance, and improved "up-time" because Cassette cleaning & maintenance is accomplished while the Leveler operates with another Cassette. Massive 4-post Cassette Leveler running w/ 1.625" Cassette. Hydraulic Leveler Roll Positioning: The Fortacero Leveler employs hydraulic cylinders rather than mechanical screws and sliding wedges associated with older technology Levelers to position its work rolls. Hydraulic cylinders mounted in the 4-post Leveler frame mate with the entry and exit ends of each Cassette back-up flight. All hydraulic cylinders employ precision electronic linear transducers to sense the position of the cylinder rod. Work rolls are tilted front-to-back to eliminate coil-set by adjusting the entry and exit cylinder elevations. 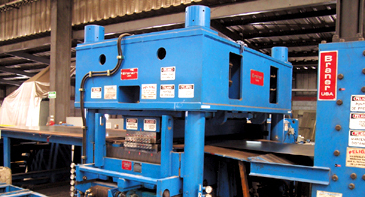 Adjusting cylinder elevations across the width of the Leveler accomplishes "work roll bending" for center-buckle and wavy-edge shape correction. Independent back-up flight adjustments front-to-back as well as side-to-side allows the hydraulic leveler to perform more precise shape correction vis-à-vis older mechanical leveler technology. Automatic Leveler Control: The hydraulic Cassette Leveler employs an industrial duty PLC for automatic entry & exit roll gap and roll bend calculations and adjustments. The hydraulic back-up cylinders are automatically positioned to establish entry and exit roll gaps based upon gauge and yield strength data input. Edge wave and/or center-buckle shape correction is accomplished by menu or operator command. 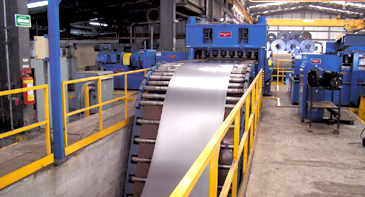 Leveler settings can be committed to the PLC memory for future recall, a valuable time and material saving feature when processing partial coil orders. An "automatic calibrate" feature allows the Cassette Leveler to be quickly calibrated in a few minutes without having to dismantle the Leveler. Cassette Leveler w/ small cassette produces panel-flat product.